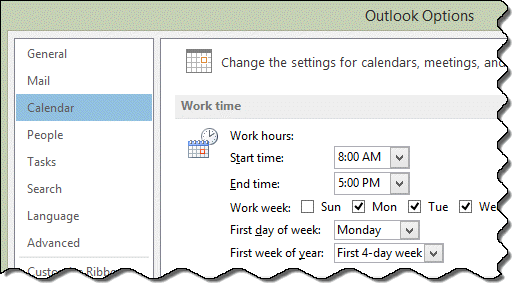 Outlook has an option for the start and end of the user's work day. Unfortunately, it's mostly for show in the calendar because Outlook doesn't include working hours in Free/Busy or warn you if you're making an appointment outside of your normal working hours. Is there a way to pop up a warning when a meeting is scheduled at incorrect times, say before 8 AM or after 7 PM? You can use a VBA macro to watch the calendar for new appointments and ask if you want keep the appointment when the start time is too early or the appointment ends after a certain time. Click Yes to leave the appointment on your calendar, click No to open the appointment so you can edit the time or delete it. This is an Application_Startup macro and needs to go in ThisOutlookSession. Click on the Application_Startup macro and click Run to test it without restarting Outlook. "Do you still want to schedule it?" ' If you say no, the opens for you to change the times or delete it.